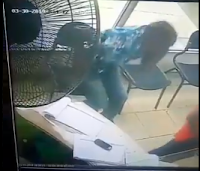 Wednesday, April 03, 2019- This guy was caught on CCTV stealing an Mpesa attendant’s phone with float of over 800k in Kisumu. From the footage, the guy is seen posing as a customer and when the lady attendant walked out leaving the phone on her desk, the guy swiftly exchanged it with another phone and left. However, some people feel this is an inside job from the casual manner in which the lady walked out knowing there were customers waiting to be served. Watch the video below and share widely for these miscreants to be apprehended.